Most of the haul came from the Democratic Governors Association, but there were other notable donors. Last week, Republican gubernatorial nominee Ron DeSantis asked why his Democratic opponent Andrew Gillum was making so few public appearances in Florida. The answer, apparently: he was fundraising in Washington, D.C. Most of that total came from a $1 million contribution made by the Democratic Governors Association. But some of the other contributors are also noteworthy. Filmmaker, actor and producer Tyler Perry gave Gillum $100,000; and philanthropist Barbara Stiefel chipped in $15,000 on top of the $300,000 she'd already given to Gillum. The DeSantis campaign noted that the Republican nominee has raised over $4.5 million between his campaign and political committee since election day. 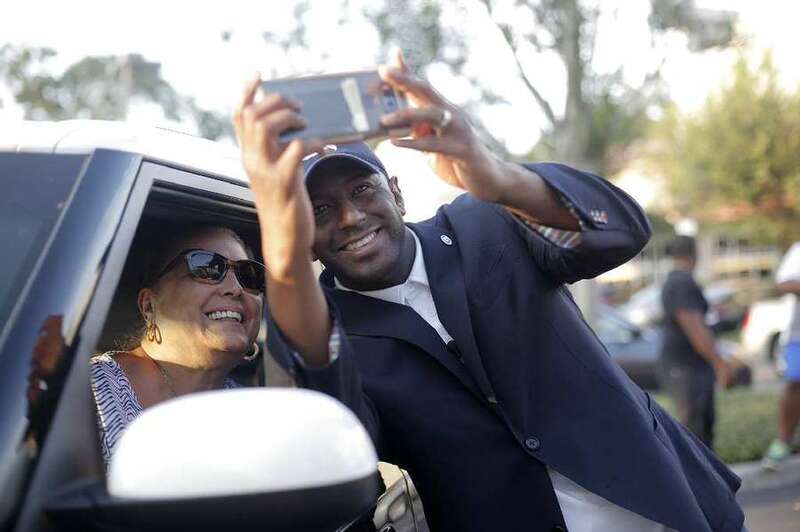 Gillum's campaign told the Times that the Tallahassee mayor wasn't just raising money last week. He connected with supporters via multiple videos on social media, and on Saturday, Sept. 8, Gillum appeared at a campaign rally in Orlando. Later last week, he was in D.C. for the Congressional Black Caucus Foundation's 48th annual Legislative Conference. This weekend, Gillum is going out of town for more fundraising, according to a Politico report. He's scheduled to appear in New Jersey at an event with U.S. Sen. Cory Booker Sunday. The Democrat's campaign was busy last week, too. Monday night, the Gillum campaign announced a series of staffing changes, including among its senior leadership. Campaign manager Brendan McPhillips, who helped steer Gillum to the Democratic nomination, was replaced by Brandon Davis, a veteran of the Democratic National Committee and the group GPSImpact. Scott Arceneaux is a veteran of Florida and southern politics who has advised Mayor Gillum since the launch of his campaign for mayor. From 2009 to 2017 he served as Executive Director of the Florida Democratic Party, a position he also held with the Louisiana Democratic Party from 2001 to 2004. Sean Pittman is the Senior Partner and Chief Executive Officer of Pittman Law Group. A longtime advisor to Mayor Gillum, Pittman's nationally respected law firm represents a diverse client list of individuals, local governments, small businesses and Fortune 500 companies. Sean is currently President and Chairman of the Orange Bowl Committee. Cesar spent the last 4 years working on the Public Policy team at Uber. Prior to that, he served as Political Director for Governor Charlie Crist's 2014 bid and managed Mayor Rick Kriseman's 2013 campaign. Joshua has run communications for Rep. Patrick Murphy's 2016 U.S. Senate campaign, the Florida Democratic Party, Rep. Lois Frankel, and most recently the super-PAC American Bridge 21st Century. Zach managed Chris King's gubernatorial campaign, served as director of voter protection for Hillary Clinton's 2016 presidential campaign in Florida and served on both Obama presidential campaigns. Roxey Nelson is a longtime grassroots organizer in Florida, most recently serving as Florida Director of Politics and Strategic Campaigns at SEIU 1199, which represents more than 25,000 health care workers in Florida. Courtney most recently worked for Mayor Philip Levine, and previously worked for Rep. Debbie Wasserman Schultz and Hillary Clinton's 2016 Florida campaign. Carlie served on Hillary Clinton's 2016 campaign in Florida, Charlie Crist's 2014 governor's campaign, for Senator Bill Nelson, and previously managed public affairs for Uber in New England. A longtime Florida strategist and fundraiser, Jon most recently served as the Deputy National Finance Director for Hillary Clinton's presidential campaign overseeing all finance operations in Southeastern United States. Karen is an attorney and a veteran of Florida and national politics, having served on President Obama's 2012 campaign in Florida, on the 57th Presidential Inaugural Committee, and as a presidential appointee in the Obama administration. John has over twenty-five years of polling experience and has polled for the presidential campaigns of both Barack Obama (2008 & 2012) and Hillary Clinton (2016) and his strong ties to Florida include polling for the campaigns of Rep. Gwen Graham (2014 & 2018) and Charlie Crist (2014). Kevin is a veteran of Florida politics and media consultant for some of the largest corporations, associations, and campaigns in the country. Kevin has been an advisor to Gillum since his 2014 campaign for mayor, a race on which he also produced the television ads. Senior Gillum staffer Geoff Burgan will be joining CATECOMM as a senior communications consultant to the Gillum campaign. Mattis has served as a key strategist for a wide range of successful campaigns, creating winning advertising for the DGA, the DCCC, governors, senators and attorney generals, including Florida's current attorney general race. Jim Kottmeyer is a veteran of dozens of campaigns, specializing in large grassroots and issue advocacy organizing. GPSImpact is a nationally recognized digital strategy firm known for crafting integrated solutions for races across the country. Doug develops and manages strategic communications, crisis management, and earned and paid media campaigns for political committees and candidates, progressive organizations, civil rights groups and Fortune 100 companies. He has served as senior advisor to the Democratic National Committee, senior advisor to Sen. Chris Van Hollen, lead spokesman for the Democratic Congressional Campaign Committee, senior aide at the Democratic Senatorial Campaign Committee, traveling press secretary for Gov. Howard Dean's presidential campaign, and communications director for the Congressional Black Caucus. Ed is a twenty-year veteran of Democratic campaigns who has been with the Gillum campaign since its launch. His experience includes Hillary Clinton's 2016 campaign, as well as successfully guiding and advising senators, governors, and members of Congress, including Rep. Patrick Murphy (2014 & 2016) and Amb. Nancy Soderberg. Christian is the founder and president of EDGE Communications, a leading Florida public affairs firm. Previously, Christian served the Florida House of Representatives as communications director and policy advisor to House Democratic Leader Dan Gelber during his two-year leadership term.